If you are experiencing pain or discomfort due to disc bulges, get in touch with the renowned neurosurgeons and spine experts at ProMedSPINE. Dr. Gravori and his team offer the most sophisticated, technologically advanced spinal treatments and provide the highest quality of patient care. To learn more about disc bulges and your treatment options, or to schedule a consultation, please call us at 888-75-SPINE. Disc bulges are common spinal condition in adults and often go unnoticed. However, if a disc bulges out from between two vertebra, it can press against the spinal nerves or allow the invertebrae to grind against each other unprotected, resulting in pain, muscle weakness, tingling, or numbness in the neck, back, arms or legs, depending on where the bulge is located on the spine. Cervical Spine Disc Bulge – A bulging disc in your neck can cause pain in or near the shoulder blades, pain that radiates down into your arms and/or fingers, and pain when turning your head. Thoracic Spine Disc Bulge – A disc bulge in the mid-back can result in muscle weakness, tingling, or numbness in one or both legs, change in bowel or bladder function, spasticity (stiffness) in the legs, or paralysis below the waist. Lumbar Spine Disc Bulge – Bulging discs in the lower back may cause dull, burning, or sharp pain that may radiate to the buttocks, legs, and/or feet. The pain can worsen when bending over or coughing. In some cases, patients lose muscle control of the bladder and bowels. Please visit WebMD to learn more about bulging discs. 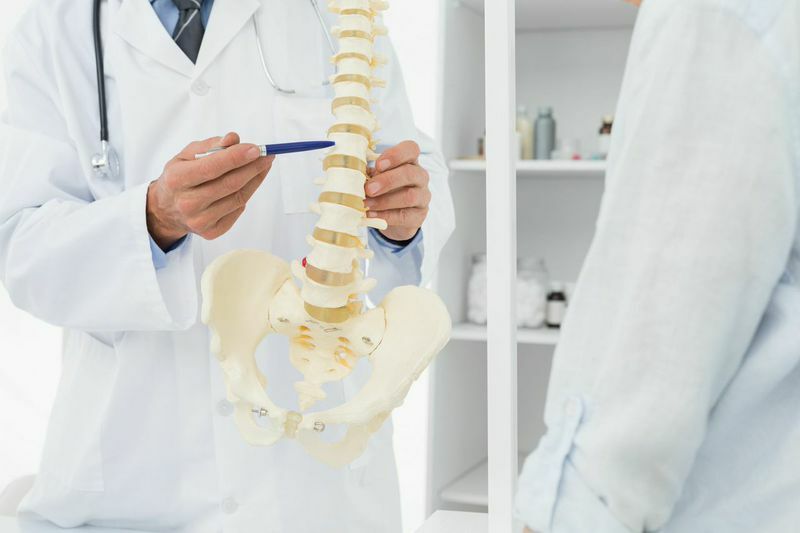 In order to receive an accurate diagnosis and effective treatment plan, it is crucial to receive an examination from an expert spine and neurosurgeon. It may be necessary to perform a CT scan, MRI, or X-ray to identify the location of a bulged disc. Depending on the specific symptoms, patients suffering from a bulging disc may be able to manage the symptoms with conservative treatment, such as physical therapy, pain medication, and activity adjustment. If the symptoms are severe or do not lessen when treated conservatively, surgery may help correct the condition. In many cases, a disc bulge can be treated with a laminectomy, in which a part of the lamina (bone that covers the back of the spinal canal) is removed in order to relieve pressure on the spinal nerves and cord. If necessary, the bulging disc may be removed with a discectomy procedure. If the thoracic spine (mid-back) is affected by a bulging disc, a transthoracic decompression procedure may help relieve the pressure by removing a part of the disc and/or part of the vertebra. The team of board-certified neurosurgeons at ProMedSPINE are highly trained in performing minimally invasive spine surgery as well as other more advanced procedures. If you are suffering from back pain, do not wait to schedule a consultation in order to determine the cause and get started on treatment right away. Please contact us online or call 888-75-SPINE for high-quality, patient-centered care you need and deserve. Next, read about nerve/spinal cord compression.